» Compact Size - Easy to include in smaller reflective growing areas. » Self Contained - No ballasts required. Just plug and go. » Low Heat - LED grow lights run far cooler than other grow lights. » Long Life - No expensive bulbs to replace frequently. » Multiple Spectrum Lighting - Customize lights for special needs. » Use with Other Grow Lights - Add LED lighting to supplement other lights. The Kessil H150 32 Watt series of grow lights is a high-performance, energy saving, long lasting lighting solution designed for the needs of today's indoor gardening. These compact units can be easily used in multiple groups, added to existing lighting and controlled by any timer setup. The modular design packs high-powered LED array packages into each unit, putting out far more light than competing products. Use Kessil H150 LED grow lights along, or in combination with other grow light systems and customize your lighting to suit any environment. The low power draw and efficiency give you immediate savings in energy bills. 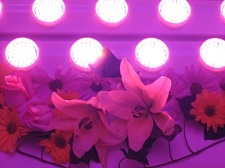 » Kessil H150 32W LED Magenta - The magenta blend of color spectra was designed specifically for plants in the flowering phase. » Kessil H150 32W LED Purple - The spectrum of this lamp is multi-purpose, and can take your plants through the entire growth cycle. » Kessil H150 32W LED Blue - Specially tuned to enhance vegetative growth, this model won't sacrifice yields. » Kessil H150 32W LED Red - The Bloom Booster model. This unit is designed for use along with any grow light system to enhance blooming. » Kessil H350 Spectral Halo - boasting 2.5x the light output of H150. By incorporating the latest 90W Dense Matrix LED™ platform, H350 produces an extremely bright, penetrating stream of light that reaches deep into the canopy of the plant.